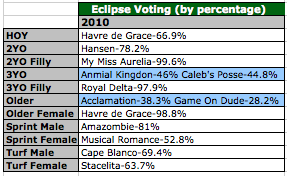 Just some final thoughts on the voting for the 2011 Eclipse Awards. My Miss Aurelia should have been an unanimous choice in the two year-old filly category, but she received 243 out of 244 votes. One voter had a need to cast a ballot for Stephanie’s Kitten, which I do not understand. My Miss Aurelia’s dominance of the division should have been honored with a rare unanimous vote. In my Horse Racing Nation blog, Dissecting the Eclipse Award Vote, I pointed out that there had only been two horses to get 100% of the vote in the past six years. My Miss Aurelia should have joined that rare group. I was a bit surprised that Blind Luck received only 2 votes in the Older Female Horse division. It was a lock that Havre de Grace was going to win the Horse of the Year title, so why not give Blind Luck some votes based on her victory over the Horse of the Year in the Delaware Handicap? Most people consided the Del Cap the best race of the year. I just missed a clean sweep in my Eclipse picks by a mere 3 votes. I thought that Caleb’s Posse deserved the Male Three Year-Old title, but he lost to Animal Kingdom 144-141. You can view my Eclipse picks here Eclipse Award Picks. This entry was posted in Eclipse Awards. Bookmark the permalink.